EL34 the Dutch Philips being recent years, penthode tubes for sound which are invented. It can make relatively easy to obtain good quality sound. It is low cost, you think as the only cheap vacuum tube which can do to obtain 10W rms at low voltage. 300B how probably will be? It costs also 100 dollars in lowest one. Sound is definite clean, but in us whom retirement age you retire it is not the price which can do to seek easily. When, EL34 does you say one 20 dollars being to be such a cheap vacuum tube. Of course, there is also expensive EL34, that is EL34 of Telefunken and Siemens. NOS. The sound which comes out of course is splendid it is not possible to hide. It meaning that sound is good definite, it does, the amplifier which used SRPP of the previous production in drive, but because it is difficult, in addition also gain is low to use in decrease of the distortion with the hitting turning off technique of the distortion there is the only fault which is difficult to use in the vacuum tube of deep bias, but the individual distortion has the feature which can be driven because low power output impedance quite is low strongly. With EL34 2A3 300B very gain it is low because input capacitance is low, is, but it is possible to obtain relatively good sound. As for the limit with the SRPP single step 2A3 and 300B are driven are very much difficult thing. Being such a simplicity, the amplifier where the components are few is SRPP, but like KT88 in the vacuum tube whose input capacitance is large as for driving seriously being to be the bias of the same, it does, but the Miller effect influencing, it becomes the sound which high pass comes out. 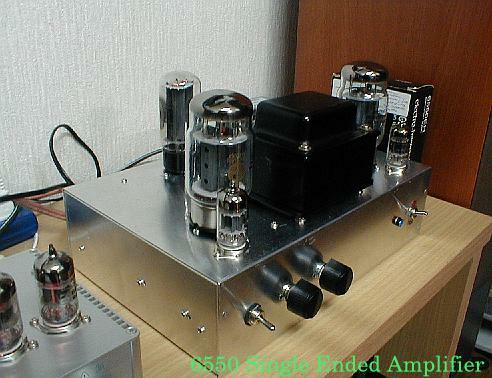 According to the literature which was seen somewhere: triode connections of 6550 and KT88 surpass even 300B singly Recently with that technique of the fashion: It tried using cathode choke drive. 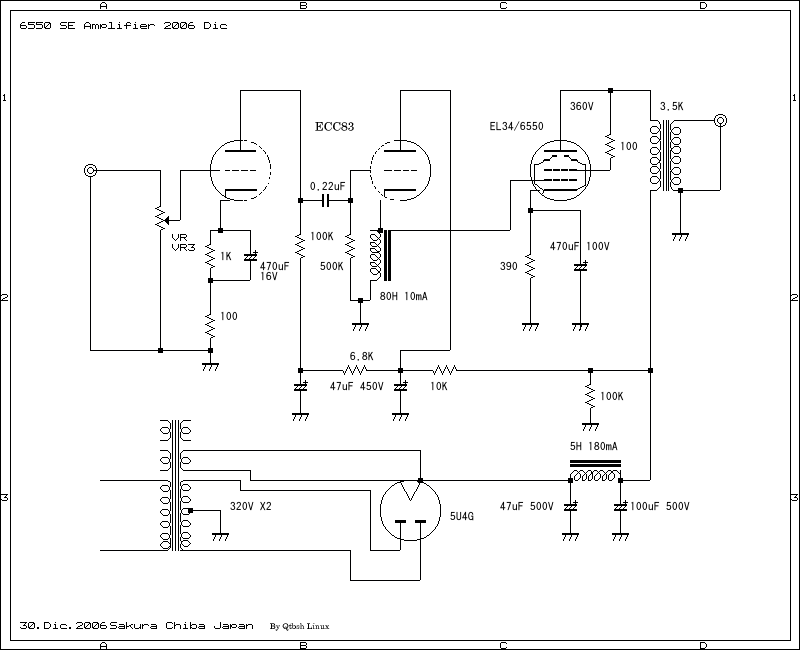 With the amplifier of 3 steps which pass with the same vacuum tube using ECC83 in drive, you saw. The sound which it comes out, it is low like limits and 300B where it will be secure, it meaning that sound of the high pass which is clear appears, it does. Choke drive is said that power of 1.5 times comes out. It is like the. Here PMC - the small-sized choke of 80H of 18 dollars, 80H was used. As for type turn NOGUCHI TRANSFORMER PMC-80H You can use small-sized Hammond output transformer in place of this choke. We do not measure, but it is possible to make the vacuum tube amplifier of relatively good sound even in small-sized output transformer. If large-sized Tango and output transformer of Tamura and Hashimoto's are used here, also it probably is possible to make a better amplifier. Capacity of output transformer of A class single ended amplifier is said that transformer of 2 times that or more the output which is generally necessary is needed. Size of output transformer of single ended amplifier of 10 watts becomes transformer of size of 20 watts or more. In other words when push pulling is made in transformer of the same core, it is designed to be the structure which can produce the amplifier of 40 watts. As for coming out here as for A class a tube amplifier it is heavy when and it is large, it becomes. Being small, the light amplifier means that also output is small. Using EL34, passed 8 watt rank being normal, when AB class is used, 30 watts being to come out, it does, recent all the difference in level dynamic types but very the amplifier which pursues the good quality of sound it becomes the amplifier of all the difference in level dynamic types. That it becomes and consumption becomes many and increases. This is the world of A class. In this circuit do the cathode circuit also the limited current and sound become good in fixed electric current type. date 13rd Apr 2008 Sakura Chiba Japan.